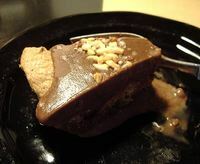 This is one of those recipe experiments that went a different direction than I planned, but was nevertheless, fabulous. Chocolatey and crunchy, and totally delish. 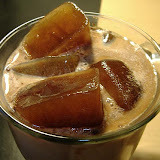 And as a frozen dessert treat, great for a hot afternoon, which we're still getting here. 1. First, make yourself a batch of chocolate chip cookies. I use the standard Toll House recipe, slightly modified. Sometimes I include a 1/4 cup rolled oats, and a handful of chopped walnute, but this time I had some delicious crunchy almond granola and I threw a handful of that in the batter. Thus began the almond avalanche. 2. Next, place the cookies in the pie tin, covering the bottom. I broke the cookies into pieces so they'd fit, kinda like a cookie puzzle. Break some cookies in half and line the rim as well. I think next time I try this, I'll try baking one ginormous cookie right in the bottom of the pie tin. 3. Mix up your instant chocolate pudding. Or make it from scratch if you're feeling adventurous. Me, I'm lazy. Cold milk, pudding mix, wire wisk, 5 minutes and you're good to go. I replaced 1/4 cup of the milk required with 1/4 cup Amaretto flavored creamer, but if you don't have that, you could just use a few drops of almond flavoring. 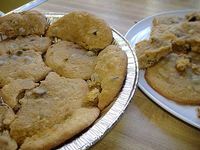 I let the pudding set up a bit before pouring it into the pie tin, hoping it would be thick enough to keep the cookies down, but some of the smaller chunks floated to the top anyway. So I just kept out a portion of the pudding, waited for it to fully set, and then poured it over the top to make a smooth surface. Sprinkle almonds on top to complete the almond theme. Place in freezer for an hour or so. This stuff was so delicious!! 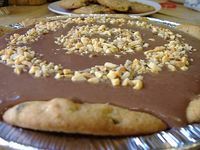 Frozen pudding is my new favorite, and with chocholate chip cookies for a crust, it's a winner with me all the way around. OH MIGAWSH - I want that now! It's a cozy night for cookies and milk....Having gale force winds tonight here in North Texas! ... but still, I need your vote for for my new cookie company name: Kalini's Kuki's or Auntie Eme's Macadamias. -- Email me or post blog comments. Mahalo iâ `oe! --- Aloha wau iâ `oe. Uhm... Christine... I didn't happen to mention I made a committment this week to losing that "last" 20 pounds, did I?